This 68 child choir robe is the perfect choice for any children's choir because it can be reused for several years as your young singers physically grow up. It's made of 100% matte polyester which provides a crisp, clean look. These beautiful children's choir robes are styled to fit comfortably with a full front closure zipper, strong front pleats, and a darted yoke. Choir robe size fits for children only, we have 12 colors for you to choose and you can choose size by measuring the vertical distance from the top of children's head to the ground. S size- Child Height 36"-41"
M size- Child Height 42"-47"
L size- Child Height 48"-53"
Our robes help make your choir performance a lot more exceptional by giving you unrivaled style and comfort without compromising quality. Child choir robe only; It features a matte finish which gives children a sweet and prefect look, and equipped with a reinforced shoulder yoke. Kindergarten choir robe design an easy-to-open zipper same color as the robe. It is equipped with a well-designed neck and pleat piping. These choir robes provide 12 colors, each one has 37 sizes available for children with different heights. Robes suitable for children; Any many size and color worked on. Choir robe size choose by chest size and height. 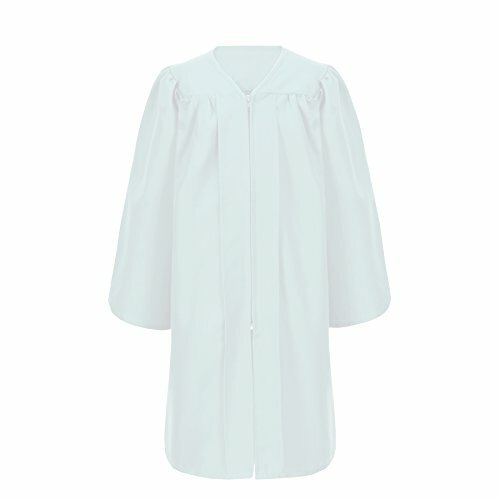 Good for graduation or church activities, our robes help make your choir performance a lot more exceptional.